Jared Kenworthy and Paul Paulus are quantifying group thought. If two heads are better than one, then three heads must be even better, right? That’s what a group of interdisciplinary researchers hopes to demonstrate. Logically, it makes sense: Harnessing the power of a group of great thinkers to solve a problem should yield more impressive results. While experimental literature exists on why and how such collective problem-solving works, it mostly focuses on short-term group interactions in a lab setting. 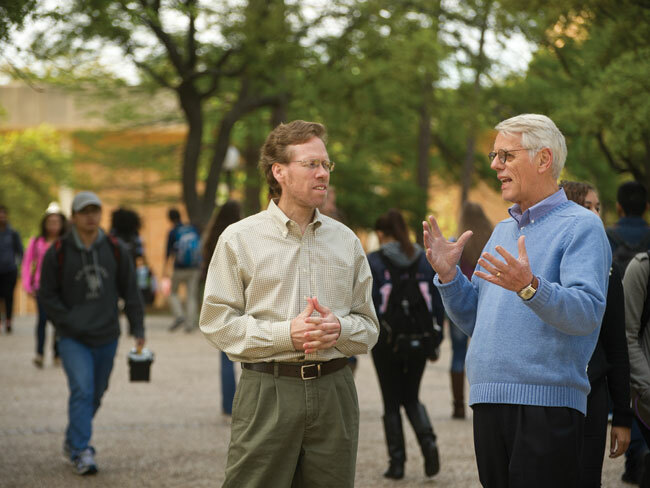 But a new study by UTA psychology faculty members Paul Paulus and Jared Kenworthy aims to quantify the dynamic nature of group creativity and innovation in long-term, real-world situations, particularly as it concerns human networks like the Internet and smartphones. The team—which includes researchers from the University of Cincinnati, the University of Stony Brook, and Hofstra University—is investigating how factors like diversity, size, the structure of the interaction process, and the extent of interaction can influence the development of creative ideas. These factors will be coded and subjected to detailed data mining and network analyses. The team recently received a three-year, $1 million grant from the National Science Foundation’s Integrated NSF Support Promoting Interdisciplinary Research and Education (INSPIRE) program. The INSPIRE grant enabled them to expand the range and complexity of their research and offer students the opportunity to be involved with the potentially groundbreaking work. Two University researchers created a windmill that can charge your cellphone battery—and it's smaller than a grain of rice.